Take I-10 West to Exit 798, HWY 146, Turn left to go South. Exit Garth Rd. Stay on feeder road. Go to 2nd Lights and turn right (Decker Drive). Go down 1 mile and make a U-turn at Rollingbrook and we are located on right. Take 1-10 East and Exit 788 SPUR 330. Continue until you Exit Rollingbrook. Stay on feeder rd and we are located on right. 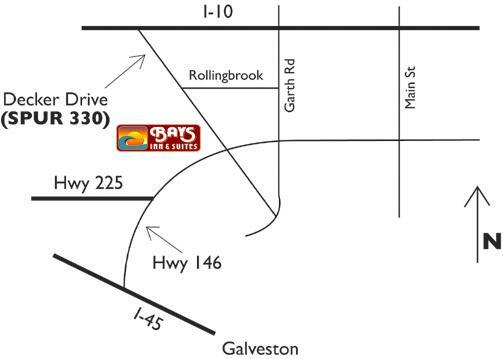 Take I-45 North to HWY 146 North to SPUR 330 and Exit Rollingbrook and make a U-Turn and we are located on right. Take Hwy 225 East to HWY 146 North to SPUR 330 and Exit Rollingbrook and make a U-Turn and we are located on right.